CUPRAP is a voluntary organization of communications professionals from colleges, universities and independent schools dedicated to advancing the understanding of higher education and enhancing the professional development of its members. CUPRAP members work in public relations, media relations, marketing, publications, sports information, web and graphic design, and more. Members come from private and public colleges and universities, junior colleges, community colleges, independent schools, as well as other organizations involved in higher education. Founded in Pennsylvania in 1980 as one of the nations few statewide organizations, CUPRAP members now come from many states. Today, CUPRAP has nearly 350 members from 100 institutions. Formed in 1980 by a dedicated group of Pennsylvania higher education public relations professionals, CUPRAP includes members from nearly all of the institutions of higher education in Pennsylvania and several in New Jersey, Maryland and Delaware. Professional Development Workshops: A number of one-day professional development workshops, in fall and spring, in different parts of the state. 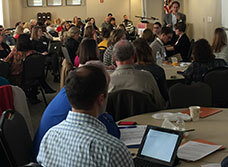 Professional Development Conference: A three-day professional development workshop, held each year in early spring. CUPRAP website, with links to members and resources. CUPRAP-L, an exclusive electronic discussion group for members. Arthur V. Ciervo Award—awarded to a public relations professional, president, higher education advocate, public official, or outstanding faculty or staff member who exemplifies CUPRAP’s fundamental purposes of supporting and advancing the understanding of higher education. Don Hale Award—awarded annually to a CUPRAP member who has significantly contributed to the organization. Joseph W. Donovan Young Professional/Rising Star Award – awarded to a person with great potential in the communications field who is under 40 years old and has been in higher education less than five years. Formed in 1980, CUPRAP has members from nearly all of the institutions of higher education in Pennsylvania. Recently, members from surrounding states have become involved. In its 35 years of existence, CUPRAP has elected presidents from across Pennsylvania.